There's a few tricks to taking sharp pictures. First of all, let's examine what causes us to take unsharp pictures. When I said move the camera - I meant for you to change your perspective! The first of the suspects is camera movement - that is, you press the shutter and physically move the camera as the shutter opens and closes. You don't have to move the camera much to kill a picture! Here's a close-up of the center of 3 pictures - all taken at the same time with available light and a hand-held camera at 1/60 second with an 85mm lens. No attempt was made to move the camera in the first two pictures but you can see a significant difference. I must admit, I did attempt to move the camera in the third image, but not by much! You can see how easily camera movement during the exposure can kill the sharpness of a picture. "The slowest shutter speed you should use when hand-holding a camera is 1/[focal length]." That means, if you are using a 50mm lens, then the slowest shutter speed you should use is 1/50. With a 300mm lens, the slowest shutter you should use is 1/300. Now for the reality: There is NO shutter speed that will eliminate camera movement! Well, it's a matter of perspective. When you shoot with a shutter speed of 1/500, very little camera movement will be observed in a 4"x6" picture. However, blow it up to 16x20 and it's likely you will see some difference between a hand-held picture and one that was taken on a tripod. Also, if you're using a low ISO, it's unlikely you'll be able to use very fast shutter speeds. The point is, no matter what shutter speed you use, learn to hold your camera steady and to press the shutter very gently without moving the camera. The focal length of your lens also affects sharpness. Have you ever looked thru high-power binoculars? They're hard to hold still as the slightest movement is exaggerated and the subject tends to bounce around while your viewing it. The same thing happens with longer-focal-length lenses. A 200mm lens or longer is very hard to hand-hold without getting some camera movement at almost ALL normal shutter speeds. A 400mm or longer lens is absolutely impossible to hand hold and get reasonably sharp results! That's why you'll almost always get better pictures from a wide-angle lens than a telephoto lens. Tripods are a great help in getting sharp pictures. The main purpose of a tripod is to steady the camera when you trip the shutter. By mounting your camera on a device that is firmly supported by three legs (humans only have two, and they're not always steady! ), we can eliminate most of what causes camera movement. 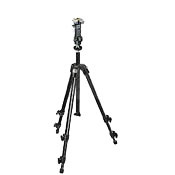 Tripods come in several styles. They all have three legs (otherwise they might be called quad-pods) but each leg can come in either three or four sections. Since the purpose of the tripod is to "steady" the camera, you want a tripod that is as steady as possible and tripods with three-section legs are steadier than the four-section legs. So when looking for a tripod, look for one with no more than three sections per leg. There is usually a center-post in most tripods. Don't extend it - make sure it's as low as it goes. The one thing that makes a tripod UNSTEADY is when you extend the center post. You're better off extending the legs than the center post. You can use your camera's self-timer to trip the shutter. Your Finger: This method has advantages. It's quick and easy. It also can help dampen vibration. It's my preferred method. Cable Release: This method is more cumbersome as you need an additional piece of equipment. A cable release used to be an inexpensive piece of equipment, but most cameras today use an electronic cable release that can be quite pricey. It connects to your camera to trip the shutter without touching the camera. The idea is that when you "touch" the camera, you're likely to move it, even if it's on a tripod. Self-Timer: This method is a way to achieve the advantage of a cable release, without one! You set the camera's self-timer to take a picture - usually in about 10 seconds. The advantage is you don't touch the camera when the picture is taken, but the disadvantage is you have to wait 10 seconds or so - and not all subjects like to wait! What if you were to touch your camera (on purpose) when you trip the shutter?? Not only that, but you were to use your finger to trip the shutter?? You don't need any additional equipment, and it's easy. But, is it effective?? These three images are extreme blow-ups of the center of the frame. Each picture is of a tree trunk with some vines on it. They were all taken using a solid tripod at low ISO with a Nikkor 300mm/f4 lens, a shutter of 1/15 second. The first image was taken with a cable release. The second was taken with a cable release and by pressing on the camera directly above where it mounted on the tripod (actually, this lens has a tripod collar and I pressed on the lens collar). The third image was taken using the mirror-lockup feature of the camera AND pressing above the tripod mounting point. As you can see, each image is progressively a bit sharper. Mirror lockup is a great feature, but is often only found on high-end cameras. You may not have that feature. But, a very useful technique is to press on your camera directly above the tripod mounting point. What that means is that if your camera body is mounted on the tripod, you should gently press on the top of your camera when you take the picture. If your lens mounts on the tripod, you would press gently on the lens collar. This seems like a radical thought to many people, but I can assure you that it works! The mirror vibration travels up the lens causing movement during the exposure. By pressing on the camera or lens, you dampen that vibration. The longer the lens, the more the vibration affects the image. I use a 600mm lens with 1/15 second shutter speeds often when photographing birds with very slow film and I can get tack-sharp pictures if I carefully press directly above the tripod mount - of course I usually use mirror lockup as well with that combination as well. Autofocus is common among newer cameras. It offers the ability to automatically focus on an object that IT thinks is the subject. If you center your subjects or use a "closest-object" feature to automatically focus on, this MAY work SOME of the time. But autofocus doesn't work ALL of the time. If you like the feature, you should use it, but learn where it fails. After a while you'll get to see where it works and where it doesn't - and where it doesn't, you should revert to manual focus.